The fiancé, the soon-to-be-step-daughter (STBSD), and I drove to Crow Creek Mine with the intention of hiking a trail we hadn’t been on before. 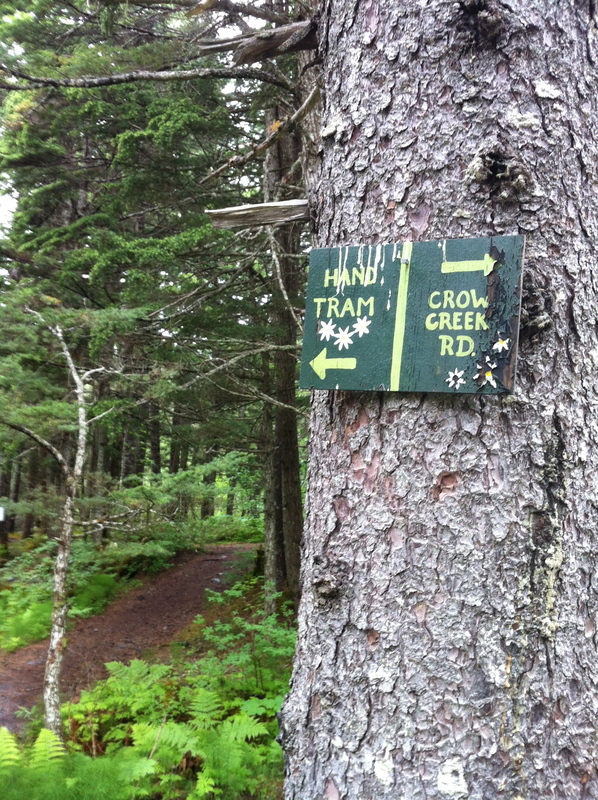 While popular with many Alaskans, the Crow Creek Hand Tram trail was new to us. 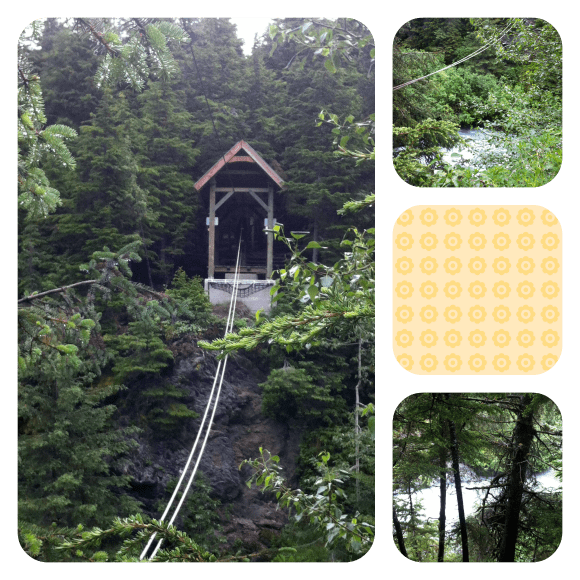 We began this adventure with a stop at the mine itself to obtain trail head directions. The lovely teen (I want to point out how lovely she was because so few teens get credit for good behavior these days) behind the counter told us our destination was ¼ mile up the road on the left. Excited, we began to beat feet. I am terrible with directions, space, distance, etc. Due to this tragic disability, I kept my thoughts to myself as we trudged up the road. Thoughts like, “I think we’ve walked further than ¼ mile”, “You’d think there’d be a sign”, and as the large trail head complete with sign and parking lot which we had passed on our way to the mine came into view, “If this was the trail head, wouldn’t she have mentioned?” Well, dear reader, this was one way of reaching our desired trail, but we would solve the ¼ mile mystery by the end of our journey. The map found at the trail head was clear and informative. There was also a sign telling us the hand tram was out of use during a repair period that began June 2nd and would continue 4 to 6 weeks. While the hand tram was supposed to be the highlight of our trip, a quick check with STBSD determined we would carry on anyway. Along the trail there were many signs stating trail choice and distance. It was also hiker friendly (well maintained and not too muddy) and I noted many a small child. 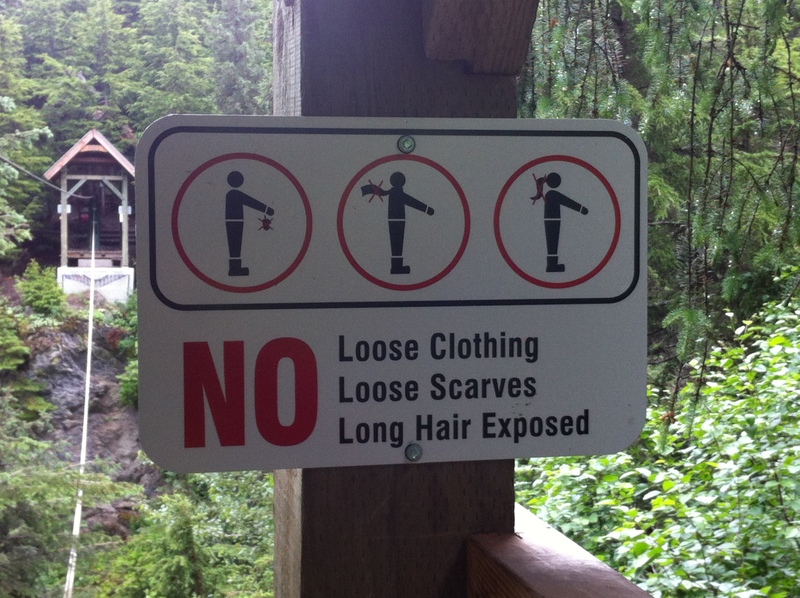 I was also encouraged by the number of hikers. There were enough to keep bears away (bears being fear #2 on my “worst fuzzy creatures ever created” list) but we never felt crowded. For the most part we were alone with the occasional head nod and “hello” as a group passed by on their way back up the trail. Upon reaching the closed hand tram we spent some time giggling at the safety signs- I always get a kick out of the poor unfortunate figures meeting with disaster. We also walked delicately to the edge of the gorge. 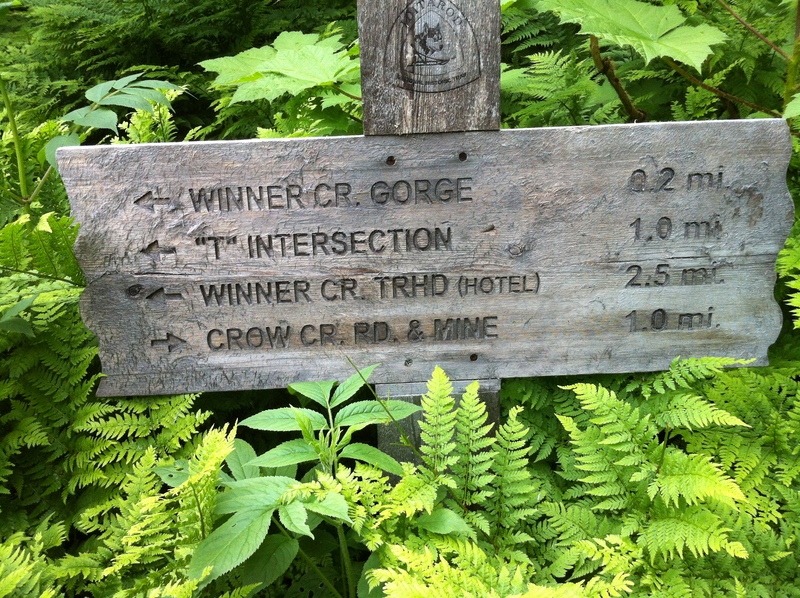 About ¾ of the way back (a total estimation calculated with my aforementioned, regrettable disadvantage when it comes to distance) we noticed a sign that read “Crow Creek Mine”. As that was where our car was parked, we opted to swerve right down this path. Sure as, well you know… we popped out right next to the mine. I would go as far as saying we popped out a mere ¼ mile away. I began to rib my fiancé about his obvious lack of man-skills, but then he giggled and pointed behind me. On a birch behind me there was a sign pointing out the entrance to the hand tram trail. We had both missed that. As we erupted into laughter, my STBSD rolled her eyes and shook her head. She’s more than used to being dragged on enjoyable misadventures. Heck, what would she do with her time if we didn’t give her something to complain about? The broken hand tram and the accompanying view.